In the Gospel today, we continue with Jesus’ great treatise on the Eucharist (John 6). Many of the Jewish listeners who hear Him speaking in the synagogue at Capernaum are grumbling and murmuring in protest at His insistence that they eat His flesh and drink His blood. But Jesus does not back down for a minute. In fact, He “doubles down” and quite graphically teaches a very real (as opposed to symbolic) call to eat His flesh and drink His blood. Let’s examine Jesus’ teaching in four stages. I. REALITY of the Eucharist – Jesus begins by insisting on its reality, saying, “I am the living bread that came down from heaven; whoever eats this bread will live forever; and the bread that I will give is my flesh for the life of the world.” Notice, therefore, that the bread IS HIS FLESH. The bread is not simply a symbol of His flesh, His body, or of His life and teachings. It is not simply a way of remembering Him when He is gone. No, it IS His flesh. Other scriptural passages also insist on the true presence of Jesus in the Eucharist and the truth that it is His Body, Blood, Soul, and Divinity. · For I received from the Lord what I also delivered to you, that the Lord Jesus on the night when he was betrayed took bread, and when he had given thanks, he broke it, and said, “This is my body which is for you. Do this in remembrance of me.” In the same way also the cup, after supper, saying, “This cup is the new covenant in my blood. Do this, as often as you drink it, in remembrance of me” (1 Cor 11:23-25). · Whoever, therefore, eats the bread or drinks the cup of the Lord in an unworthy manner will be guilty of profaning the body and blood of the Lord. Let a man examine himself, and so eat of the bread and drink of the cup. For anyone who eats and drinks without discerning the body eats and drinks judgment upon himself (1 Cor 11:27-29). · When he was at table with them, he took the bread and blessed, and broke it, and gave it to them. And their eyes were opened and they recognized him; and he vanished out of their sight. Then they told what had happened on the road, and how he was known to them in the breaking of the bread (Luke 24:31, 35). Thus the Lord first teaches them of the reality of the Eucharist, of the bread and wine that He offers: it is in fact His Body and Blood. But as it turns out, you might say he had no “Amen corner.” The old spiritual was demonstrated that goes, “Way down yonder by myself and I couldn’t hear nobody pray.” As we continue with this gospel next week, we will see that their reaction is one of revulsion so severe that many will leave Him and no longer walk in His company. Yes, Jesus gets emphatic and uses the intensifier “Amen, Amen I say to you” which is the Jewish equivalent of “Let me be perfectly clear.” He also switches His vocabulary from the polite word for “eat” (φαγεῖν (phagein) in Greek) to τρώγων (trogon), which more graphically and almost impolitely speaks of gnawing on, crunching, or chewing His flesh. Jesus wants to be very clear. His listeners now understand Him to speak literally, rather than metaphorically or symbolically. Jesus assures them that He expects to be understood literally. Why is He so emphatic? He wants to save us; He links the eating of His Body and Blood to eternal life: Whoever eats my flesh and drinks my blood has eternal life, and I will raise him on the last day. In order to be raised up and to make the journey to eternal life, we must be sustained and strengthened for the journey by eating His flesh and drinking His blood. It is just like the manna that sustained the Israelites for forty years in the desert as they journeyed to the Promised Land. Had they not eaten, they would have died in the desert. And so it is for us in the desert of this world. Without our manna, our Bread from Heaven, without the Body and Blood of the Lord to sustain us, we will not make it to the Promised Land of Heaven. Jesus insists and says, “Unless …,” “Eat …,” else the journey will be too long for you! For my flesh is true food, and my blood is true drink. Your fathers ate the manna in the wilderness, and they died. I am the bread which comes down from heaven, that a man may eat of it and not die. A. Intimacy – The Eucharist is called Holy Communion because, by it, we grow into a deep, lasting union with Jesus. Our knowledge and experience of Him in our life becomes deeper and more real. We see and experience His power at work in our life. B. Increase – We find that our life grows richer. Sin is put to death and graces come alive. We are more joyful, confident, and serene. We are less vain, angry, lustful, and distracted. Jesus in His Eucharistic indwelling of us produces these effects over time. C. Immortality – Eternal life refers to the fullness of life more so than its length. And thus we become more alive as we grow into Holy Communion with the Lord. This happens even now, though its fullest effects wait until Heaven. But don’t miss the “now-ness” of eternal! It begins now and grows deeper with each year. Heaven will see its full unfolding, but even now a growing experience of a fuller and fuller life is to be the normative experience of every Christian. The Teaching of the Eucharist was a costly teaching for Jesus in many ways. Clearly it pointed to and flowed from His horrific passion and death. But even before that, He had much to suffer in the murmuring of many disciples. As we continue with this gospel next week, we will see that many would no longer follow Him because of this teaching. It was, to be sure, a shocking—even graphic—teaching. And yet, so critical was it to the Lord that we obtain the Eucharist, that He was willing to risk rejection and ultimately give up His life so that we could have it. A costly meal indeed. I sometimes get requests for help in understanding the Latin texts of the very familiar hymns for Eucharistic Adoration and Benediction. The O Salutaris and Tantum Ergo, though familiar to many Catholics remain only vaguely understood in terms of a word-for-word translation. Most know the poetic English renderings (“O Saving Victim Opening Wide” and “Humbly Let us Voice our Homage”) but this does not necessarily facilitate a word-for-word understanding as the Latin is sung. What I hope to do here, and in greater detail in the attached PDF files, is to give a very literal rendering that preserves the word order of the Latin so that one can understand the Latin precisely. In the PDF I also give a brief word study of each word in both hymns. It is my hope to bring these hymns more alive for the faithful who sing them who may not be highly skilled in Latin. I have prepared a printable and more thorough word study here: Study the TANTUM ERGO. I hope that this may be of some help along with the printable PDF word studies. And Pledge of future Glory is given to us. O Sacred banquet (O Sacrum convivium) – In recent decades there was perhaps a tendency to over emphasize the meal aspect of the holy Mass, without due and balanced reference to the sacrificial aspect of the holy Mass. But the necessary correction in more recent times, back toward emphasizing that the Mass makes present the Sacrifice of the Cross, should not lead us to forget the mass is also a holy banquet, a sacred meal with the Lord. For the Lord says, For my flesh is real food and my blood is real drink (Jn 6:55). Thus, the Holy Eucharist is no mere sign, or symbol, but is in fact the true food of Christ’s true Body, true Blood, Soul and Divinity. The Eucharist, is also a foretaste, a praegustatum, of the great banquet in heaven, of which Christ says, And I confer on you a kingdom, just as my Father conferred one on me, so that you may eat and drink at my table in my kingdom and sit on thrones, judging the twelve tribes of Israel (Lk 22:29-30). And yet again, Here I am! I stand at the door and knock. If anyone hears my voice and opens the door, I will come in and eat with him, and he with me (Rev 3:20). Note too that the Latin word convivium, of which “banquet” is an adequate translation, but also contains nuances that go beyond a mere meal. The Latin emphasizes a kind of coming together a sort of celebration of life. Con (with) + vivere (to live). Hence, the meal here is no mere supplying the food or calories. It is a coming together to celebrate new life. We receive the food of Christ’s Body and Blood, which not only gives an ingredient for life, but is in fact the true and very life of Christ. In the Eucharist, we receive Life Himself, for Christ said of himself, I am the life (Jn 14:6). And further, he declares, As the living Father sent me, and I live because of the Father, so whoever feeds on me, he also will have life because of me. (Jn 6:57). Of this life, he further describes it as “eternal life,” a term which refers not merely to the length of life, but also to the fullness of life. Thus the Holy Eucharist is a meal, but no mere meal, it is Life, it is a convivial celebration of that life; it is a banquet which gives Life Himself. In which Christ is received (in quo Christus sumitur)– Here again, is affirmation that we do not receive mere food, we receive Christ himself. This is no mere symbol, no mere wafer, no mere memory. It is Christ himself that we receive. Imagine, the Lord being in a moment of a passive relationship with us. He lets himself be taken up, or taken in by us. He is taken up, and becomes our food. Here is an astonishing humbling by our God, who then allows himself to be assimilated by us, and thereby assimilates us into him. His humility, is meant to conquer pride in us. Yes, in this great banquet Christ himself is taken up, is received, is assimilated by us. And in this humble manner we are taken up into him, taken in, more perfectly to be a member of his body. The memory of his passion is recalled (recolitur memoria passionis eius) – The Eucharist is not only a meal, it is the making present of the Passion, Death and Resurrection of Jesus Christ. In every mass, we are brought to the foot of the cross, and the fruits of that Cross are applied to us. We are also at the resurrection, for in Holy Communion we receive Christ who is living, present, and active. The Latin verb recolitur, is properly translated “recalled.” However, once again there are nuances in the Latin verb which are hard to render with one English word. The Latin verb recolere means “to cultivate anew.” This somewhat agrarian image points to a kind of careful and intentional growing and fostering of something, in this case the memory of Christ’s Passion. To cultivate in agriculture, is also to prepare for, and or pave the way for the growth of something. It means to prepare the soil. In non agrarian settings, to cultivate anything implies a kind of care for it, and intention to foster the growth of something, to further or encourage something. The other word, “memory,” is also a very precious word. What is memory and what does it mean to “remember?” To remember is to have deeply present in my mind and my heart what Christ has done for me, so that I am grateful, and I am different. It means to have it finally dawn on us what Christ has done for us in such a vivid and real way that our hearts and minds are grateful, transformed, and different. Our hearts of stone are broken open and God’s light and love flood in and we are changed. This is what it means to remember. It is of course and ever deepening process to recall the memory of His Passion, not a mere one time event. Our venial sins are forgiven, our holiness is increased, our union with Christ becomes more perfected, we gradually become the One we receive, we receive strength and food for the journey across the desert of this world unto the Promised Land of Heaven, we receive life, and begin to participate in eternal life, our union with Christ and membership in his body is strengthened, as is our union with one another, and our union with the saints in heaven. Yes, so many grace are infused, are poured forth into the mind and heart! Yes, here is a pledge of future glory, of victory. Jesus alludes to the manna in the wilderness that sustained them for forty years in the desert. It was a sign of the victory to come. For why would God sustain them in the desert if he did not will to lead them ultimately to the Promised Land? It is the same for us. That God feeds us in this way is a sign and promise of his will to save us and bring us to the Promised Land of Heaven. He blesses and strengthens the journey and so adds surety and the pledge of the destination of future glory. Not a bad little summary of Eucharistic theology, all in a short antiphon. I participated in my first Eucharistic Congress in 1979 when the Archdiocese of Philadelphia hosted the congress and I served as an usher at the closing Mass. This year, I have the privilege of going as a speaker but more on that later. The Archdiocese of Washington will be represented by myself and three other staff people who are at the Congress for different reasons and who have all agreed to blog so that you can follow the highlights through the eyes of our blogging team. Sr. Revelacion Castaneda, who is traveling with a group of young people from all over the U.S.
Sr. Mary Dolora Keating, Director of the Office for Consecrated Life who is representing her religious community. 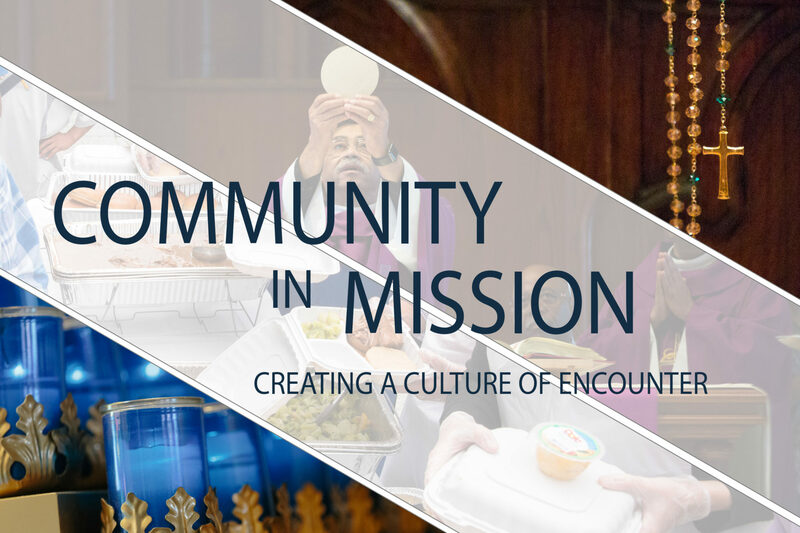 While the celebration of the Eucharist is the central event of each day, the place of the Eucharist in our lives is explored in catechetical workshops, personal testimonies and cultural events. We will try to give you a taste of each part of the congress. We look forward to sharing our week with you.